Plymouth, MA—Get an up close and personal view of one of Plymouth’s nesting pair of osprey at the Osprey Viewing Station on Long Beach starting Memorial Day weekend. (Photo above by Gene Harriman). Beginning Friday, May 23, Beach Ambassador volunteers will set up a spotting scope pointed at the nest so visitors can watch the osprey family as the chicks grow to young adulthood. The nest is located on Ryder Way, which you can access by walking from the main parking lot at Long Beach, or by vehicle if you are a Plymouth resident and have a 4-wd beach sticker (available at Town Hall). There is a parking fee for the main lot. 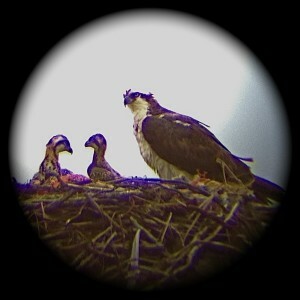 Finding out more about Ospreys intrigues the whole family. The Osprey Viewing Station will be open on Friday, May 23, from 1 p.m. to 5 p.m., on Saturday, May 25, from 9 a.m. to 1 p.m. and Sunday, May 26 from 11 a.m. to 3 p.m. In cases of inclement weather, the station will be closed. Beach Ambassadors will be on hand to tell visitors about the osprey and to interpret their behavior. Visitors can become citizen scientists and aid in osprey research and monitoring by adding their observations to the osprey journal, and test their knowledge about raptors in a game: Red-tailed Hawk vs. Osprey. Stop by and find out more about a bird family that makes Long Beach its summer home! 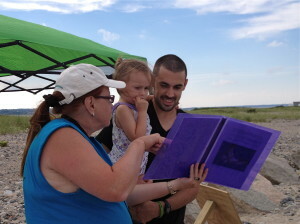 The Beach Ambassadors will run the osprey viewing station most Fridays through Sundays during the summer. They will also run kids’ nature discovery activities on the main beach and lead nature walks. You can check the online calendar to find out dates and times of the programs before your visit to Long Beach: http://www.goldenrod.org/blog/calendar-of-events. See you on the beach!